Since Baldwin was a skeevy real-estate salesman in that movie and not selling lawn maintenance services, there might not be much applicable wisdom from that speech (except for the fact that yelling “coffee’s for closers only” at co-workers on occasion can be a lot of fun). But he does talk a lot about closing deals. And while your watch doesn’t need to be worth more than other people’s cars, Baldwin’s character does hammer home the importance of the close. As a lawn maintenance business, you do need to close deals in order to grow. You need to have a good amount of new customers coming in the door. 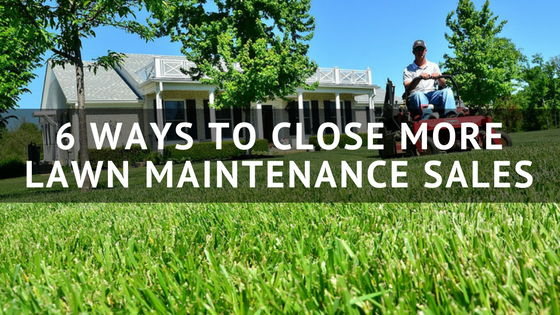 Here are 6 ways that you can close more of your lawn maintenance deals. One common mistake that many lawn maintenance businesses make right off the bat when dealing with prospects is treating them all the same. They assume that just because their prospect’s lawn might be the same size, it will be just like other lawns they take care of. Do the due diligence and know what the prospect’s lawn will actually be like to mow. Get an accurate idea of what the obstacles might be, any difficult slopes or anything else that might be an issue for mowing. Doing the work upfront will also show that you know what you’re talking about. If you’ve already walked the property, having a system to come up with an accurate estimate can help with your close. Showing numbers to a prospect will give them an idea of all the factors that are going into your total costs. If they are able to see that they’re being charged X amount for mowing Y square feet and then the cost of trimming, they are able to understand why you’re charging what you’re charging and will make them feel more comfortable. Social proof might feel like you’re “name dropping”, but it can be a powerful aspect of closing. People want to know that the lawn maintenance services they’re paying for are quality and that others have benefited from the same company. If you have customers in the same area, mention that you mow a few of their neighbors’ lawns. If you’re working with a decision maker in the buying process and know that it is going to take more than one person to close the deal, make sure you’re still treating that person like the buyer. Many lawn maintenance businesses will make the mistake of writing one person off because they don’t have the final say. But if they have a say at all, you should be working to get on their good side. Provide them with estimates, ask them the qualifying questions and even ask for their business. Ask them questions like, “does this sound good to you” or “if you were to guess, do you think your (husband/wife) would be interested in this, too”? While one person might not have the final say, they still have a voice in the matter. Sometimes, a deal might hinge on one sticking point. A customer might not be ok with the cost of trimming, or they might not feel like they need to have their lawn mowed once a week. Whatever is holding back the deal, try to be creative with offers. If you have the ability to offer discounts on certain services, use them to tailor an offer to move the sale forward. Use low cost/high margin services to sweeten the deal and get the customer to say yes. Lastly, many salespeople simply don’t ask for the sale. They think that the question has been posed after an estimate has been presented. But for many prospects, they don’t know what their next steps should be. They don’t know what is expected of them. Be direct and ask for the sale. Want to see how lawn maintenance software can help you close more deals? Then sign up to learn more about FieldCentral, the easiest way to take control of your business.